Congratulations! 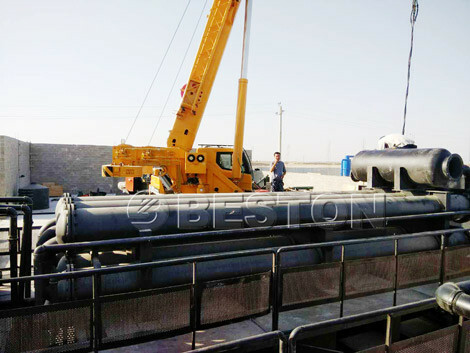 BLL-20 continuous plastic/ tire pyrolysis plant is being installed in Uzbekistan. Our professional engineer has been dispatched to Uzbekistan to help our customer to install the pyrolysis plant. With the help of our experienced engineer, the whole plant will be installed well and quickly. BLL-20 waste tyre pyrolysis plant in Uzbekistan is a kind of machine that can dispose of waste tyre and waste plastic to fuel oil. Due to its continuous type, it has large daily capacity- 20t. The reactor of the BLL-20 can achieve one side to feed and another to discharge at the same time. The whole plastic pyrolysis process becomes more efficient. Therefore, the plant can save much fuel materials and cost for customers. Certainly, we also have BLJ-6, BLJ-10, BLJ-16 tire recycling machine for sale. The output of these plants are 6t-16t. If you want to invest small plastic or tyre recycling business, you can choose the BLJ-6, BLJ-10 model. They absolutely can bring you great benefits. With the development of society and economic, waste plastic and waste tire are increasing rapidly. In order to protect the earth we lived, we need the pyrolysis plant to deal with them. Believe the BLL-20 waste tyre pyrolysis plant in Uzbekistan will effectively improve the stacking problem of waste tyre and plastic. If you want to know more, you can contact us.